The usual C-band radar band is 5.4-5.9 GHz. Many use up to 1.5 MW peak power. You might could do a quick site RF survey with a SA and a standard gain horn (with a LNA). If it is in-band, you may have to even install a diffraction fence. We had to do this last month for a new uplink station we own. It was not cheap to design or build. Our company used work in radar in the 1980's. Once we were on a AF base and a new base commander came to town. The new commander did not like the fact that some of the fluorescent lightning in the hangers had a pink tint, and others had blue tint, he wanted all of the lights to have the same tint. The poor janitor spent all day swapping out bulbs. That evening, he had a arm full of fluorescent bulbs and walked near the new mobile radar we were testing. They bulbs all light up in his arms and he threw them all away. It was a big mess. Stuff like this you don't forget even after 30 years. I had forgotten about the old SA and whatever the other SEDAT RX was. I have a station with at least one of those down converters still hanging on the wall. Found one of those at the transmitter site hiding on a shelf last year. It's now in recycle-heaven. For several years, I used two SA DATS32 chassis as sawhorses. Last edited by grich on Thu May 17, 2018 10:05 am, edited 1 time in total. I think the other system was the Fairchild Sedat system. It was alot similar to the SA 9000right down to size and changeable receive modules. I recall they worked pretty well but had a few dropouts the SA system did. The LNB down coverter was post mounted then went 70mhz to the studio receiver. The down converter had a distinctive large up pointing arrow for proper mounting. Yes... Fairchild Dart 384. It was the better receiver of the two IMHO, you could change transponders with a thumbwheel, the SA required you change crystals. A lot of folks made a reed relay crystal switching contraption to allow for changing SA transponders. SEDAT was actually an upgrade for these receivers after they'd been in service for quite a while. One stereo 15K card, one split 7.5K card and a voice cue card is how they originally shipped. I think the other system was the Fairchild Sedat system. At one site I saw, the dish was 300 feet from the building. The 70 MHz downconverter was feeding 300 feet of buried CATV line, about the size of RG-11 with an aluminum shield covered in a goo-filled PE jacket. 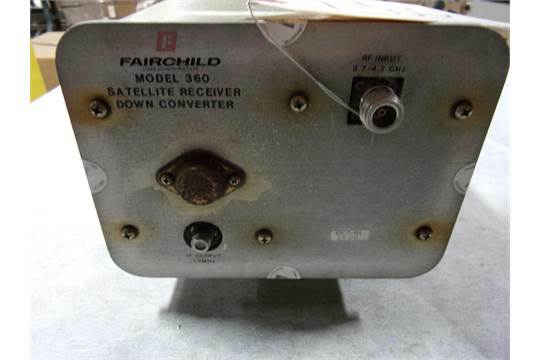 I don't remember if an amp was needed in front of the Fairchild chassis. Corporate sent me a spectrum analyzer. But another is scheduled for July so stay tuned.